FASH Limited Satchel style Tote Bag is a 'Must Have' bag in every fashionistas wardrobe. It is the perfect bag to carry to complete your look. 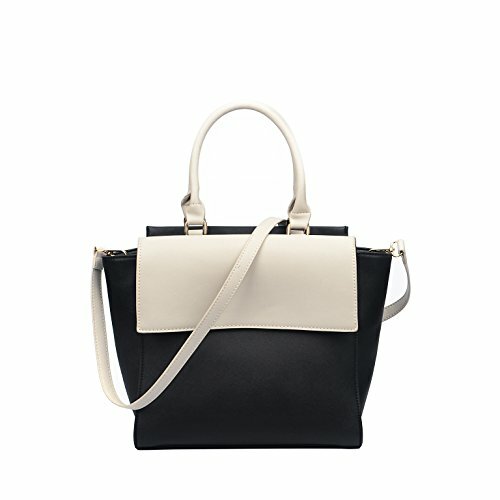 This modern style bag is practical and fun to carry. Take your look from day to night with this bag. Suits every style and every occasion. Made from good quality faux leather to give it a good feel. Perfect size to carry all your essentials in. The zipper closure helps keep all your belongings safe and secure. Approximate Dimensions: Exterior - 10.41" L X 11.15" W X 5.07" H; Shoulder Strap Drop: 16.77"; Handle Drop: 5.46"
Made of Good Quality Faux Leather. Comes With a Shoulder Strap to make into a crossbody Bag. Has a Zipper Closure and Gold toned Hardware. One zipper with Side pockets inside to keep all your small belongings. If you have any questions about this product by FASH Limited, contact us by completing and submitting the form below. If you are looking for a specif part number, please include it with your message.